In the place where the catchment basin of the Simmerbach River has formed a large depression ('Simmerbach Mulde') over thousands of years, lies the administrative centre of Simmern, once capital of a principality by the same name. This principality was founded in 1410 by the Earl Palatine Stephan (1410-1459) of the house of Wittelsbach, which politically joined the estates of the Electoral Palatinate to the Hunsrück region, with Simmern as the administrative centre. Emperor Ludwig of Bavaria had already given the town its charter in 1330, at a time when the territorial discord in Hunsrück had reached its peak. This was due, on one hand, to the Earls of Sponheim who owned properties on the Nahe and Mosel Rivers and wanted to cement their ties by control of Kirchberg, Gemünden, Koppenstein and Kastellaun. On the other hand, there were the highly expansionist politics of the Trier Electorate and Archbishop Balduin of Luxemburg (1307-1354), as well as the active efforts of the Earl Palatines from the Electoral Palatinate to create a position of power in the centre of Hunsrück. The heyday of the newly created principality lasted more than 250 years, until, the Thirty Years War and the War of the Palatinate in 1689. During these conflicts the town, together with its medieval fortress, was almost completely destroyed, leaving just a few houses. The "new castle" was built in the years 1708-1713 in the classical style: a simple main building with two parallel wings that were elongated in front. Originally designed as the official residence for the Palatine head bailiff, the new castle was later used as a garrison, school and a court. Today the Rhine-Hunsrück archive is kept here, along with a library and the Hunsrück Museum, where the special features, history, and culture of the region are documented. Among the sights worth seeing in the town, of particular note is the three-nave, Late Gothic Stephan Church ("Stephanskirche") dating from 1486, with highly artistic tombstone monuments, and the Parish Church St. Joseph, which has an important ceiling painting by Francesco Bernardini and a Stumm organ from 1753. St. Joseph lies nearby in the late Carmelite Monastery, which was founded in 1703. 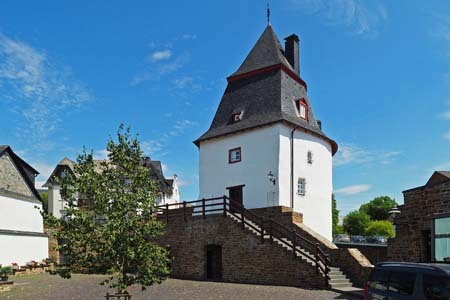 The landmark of Simmern, however, is Schinderhannes Tower. It was a corner tower of the city wall, built between 1320 and 1330. For over 300 years it served as a "powder tower" for storing powder and all types of war equipment. In 1680, it was made into a prison with a ground floor that had neither windows nor doors. A few years later, along with a few other buildings in the town, Schinderhannes Tower survived the great fire of 1689 wholly undamaged. In 1750, the steep, conical roof it still has today was built. It was here that the robber chief Schinderhannes was kept prisoner for six months between 26 February 1799 and 19 August 1799, until he managed a spectacular escape. From 1930 to 1972, the tower served as a youth hostel. Today, there are comfortably furnished rooms where anyone can have parties and celebrations provided they pre-book. In Roman times, in Simmern and the surrounding area, there existed a whole row of estates. No wonder, since Simmern lies directly on the old Roman road Via Ausonia, which passes through Hunsrück and connected Mainz to Trier. Today the old Roman road makes it easy to plan walking tours with the starting point in Simmern. How would it be, for example, to take the following day tour? From Simmern walk to Nunkirche Church near Sargenroth. Here one can already make out Hunsrück Cathedral near Ravengiersburg in the distance, which will be reached at lunchtime. After lunch, continue on to Kauerbach Stream and the village of Rödern, where one reaches the "Via Ausonia". Passing over the Roman road, it is then a good hour until the starting point is returned to. Alternatively, one can get to Ravengiersburg from Nunkirche Church, and cross the low creek valley to Wildburghöhe (629m). The return journey is along Kohlweg trail to Simmernkopf (653m), and from there on to Simmern -an adventure in any weather!